GMO Internet Group company, GMO Payment Gateway on April 27, 2016 made an undisclosed amount of investment through GMO Global Payment Fund, in One MobiKwik Systems Private Limited, which offers mobile wallet (*1) services in India. GMO-PG decided to invest in MobiKwik as a new strategic partner as part of a focus on the market potential of India. The investment is being made jointly with major US venture capital firm Sequoia Capital and other parties. GMO-PG and MediaTek (Taiwan), the world’s biggest fabless semiconductor company, are jointly lead investors for MobiKwik. India has a population of 1.2 billion (2013) and a GDP of approximately JPY2.2 trillion (2015). 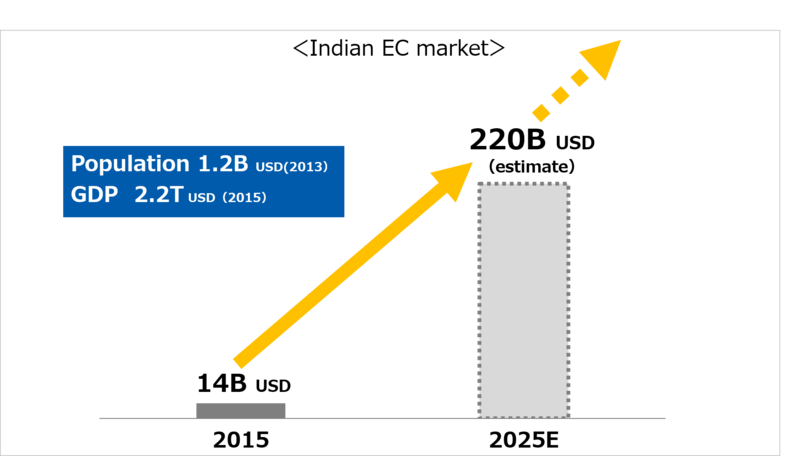 It is an enormous market forecast to expand to a population of 1.4 billion with a USD3.4 trillion GDP by 2020(*2). In particular the rapidly expanding ecommerce market is predicted to grow from USD14 billion in 2015 to USD220 billion in 2025(*3). The number of people with mobile phones, including smartphones, exceeded one billion as of October 2015, around 80% of the population (*4). On the other hand, only half the population hold bank accounts (*5), and the ownership of credit cards is limited to less than five percent (*6). Thus, the use of mobile wallets, which enable payments for purchases at online shops, utilities, and physical stores through the use of a smartphone or other type of mobile phone, is becoming a standard alternative method of payment to cash, and the size of this market is expected to grow to USD6.6 billion by 2020 (*7). GMO-PG led this investment through GMO Global Payment Fund in MobiKwik, one of the two major companies that offer mobile wallet services in the country, in a bid to form a new strategic business partnership with a promising and growing company in India. Together with MediaTek, the world’s biggest fabless semiconductor company, GMO-PG is lead investor in a joint investment with major venture capital firm Sequoia Capital and other parties. 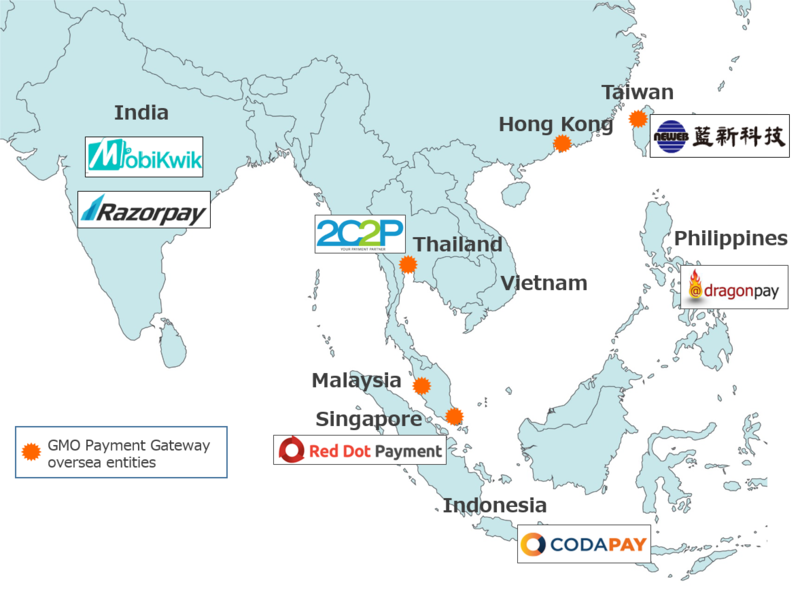 GMO-PG has local subsidiaries at five key locations; Singapore, Hong Kong, Taiwan, Malaysia, and Thailand offering Z.com Payment, its overseas payment service catering to Japanese e-commerce businesses expanding business in these regions. GMO Global Payment Fund is a fund specialized in payments for promising local payment related businesses. Through these two businesses, GMO-PG is achieving synergistic effects as it pushes forward its overseas strategy to expand in the Asian region. *1 Mobile wallet: A prepaid payment method that uses mobile terminals such as smartphones. Users can employ mobile wallets to charge their credit cards, conduct online banking, and use cash on their mobile terminals for purchases at online shops, pay utility charges, and make purchases at physical stores. Authorizations for payment include smartphone numbers and IDs. MobiKwik is India's largest independent mobile payments network connecting 28 million users with 50,000 retailers. It enables users to discover retailers (brick-and-mortar stores, e-com websites, m-com apps, billers, telcos) and then start paying them with 1-tap. MobiKwik is powering payments for IRCTC, Uber, Meru Cabs, Shuttl, Big Bazaar, OYO Rooms, Zomato, Barista, PVR, Archies, WHSmith India, BookMyShow, Grofers, Big Basket, Domino's, Pizza Hut, eBay, ShopClues, Myntra, Jabong, Pepperfry, Star Sports, GoDaddy, MakeMyTrip, Cleartrip, and Yatra. The company has raised close to $30 million in funding till now from Sequoia Capital, American Express, Tree Line Asia, and Cisco Investments. With MobiKwik, users load money into the wallet once using cash, loyalty points, debit card, credit card, and netbanking to make secure 1-tap payments for online or offline purchases. Most MobiKwik users make 10-12 purchases every month using their wallet balance across diverse use cases such as recharge, bills, food, grocery, travel & cabs, shopping, entertainment, etc. Users also transfer money to wallets and bank accounts of friends and family using MobiKwik. Users today enjoy MobiKwik wallet services on Android, Windows, and iOS mobile applications and on MobiKwik.com. MobiKwik aspires to be the largest source of digital transactions in India. The company’s goal is to empower 150 million Indians to pay $5 billion digitally to 500,000 retailers. GMO Payment Gateway offers online payment processing services for credit cards and other payment methods to 65,652 merchants (as of December 2015, GMO Payment Gateway Group) including operators of online shops and sellers of digital content; operators who collect recurring monthly payments, such as NHK and those who offer subscription purchases; and public organizations such as Japan Pension Service and the Tokyo Metropolitan Government. GMO-PG aims to enable both consumers and businesses to enjoy payment methods that are convenient and equipped with high levels of security and to serve as the infrastructure for payment processes in Japan. GMO-PG will promote initiatives for new innovation such as FinTech and contribute to improving the rates of e-commerce in Japan as a leading company in the payment industry.